The reason for revealing it now is that it's going to debut on MSC Meraviglia in less than 90 days. But it's nothing they just threw together. MSC has been developing MSC for Me for three years in conjunction with a list of top names in the tech and behavioral science fields. 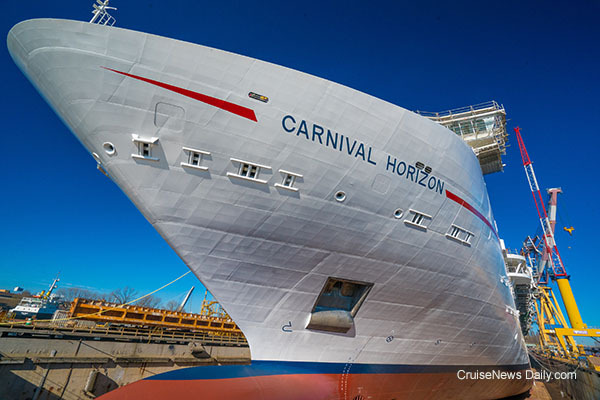 Carnival Horizon will debut in Europe in just a little more than a year from now, and today it passed a major construction milestone when water was let into the dry dock at Fincantieri's Marghera shipyard. Details appeared in the March 10 edition of Cruise News Daily. Carnival Horizon in the empty dry dock. Water will flood in after the coin ceremony and christening with a bottle of champagne. Remember the murder mysteries that were all the rage on cruise ships for a long time? Many lines had them. They went ashore, got reworked, and became “escape rooms.” And now they're coming back aboard. Four Norwegian ships now have escape rooms from which passengers have to solve the puzzle in order to escape. A few days ago we told you about the continuation in 2017 of Eurodam's incredible string of perfect scores on US Public Health inspections (eleven!). Now comes an announcement that another Holland America ship, Oosterdam, has also achieved a perfect score. Oosterdam's unannounced inspection was held March 3 in Tampa during the ship's turnaround between cruises. Details appeared in the March 9 edition of Cruise News Daily. Royal Caribbean had a bevy of announcements today, mostly to do with ports, but there was big ship news included, too. Something for everyone, as long as you were in Miami or the Bahamas. Bangladesh is not a destination you normally think of when you think about going on a cruise, but taking travelers to remote and unusual places in luxury is what Silversea is all about. Proving that point, last month, Silversea took passengers there on the country's first-ever call by a cruise ship. Think back, if you will, to the morning of May 8, 2016. Carnival Pride had sailed trouble-free through Chesapeake Bay toward Baltimore, and glided right into the port. As it approached the pier, things began to go wrong, and the ship's bow struck the pier and fendering. It then struck the passenger boarding bridge, destroying it when it fell over, slightly damaging three vehicles parked under it. After ten months of investigation, the National Transportation Safety Board released their findings today. Did Juneau There's No Sales Tax on Cruise Ships While in Town? After lots of discussion, Juneau's Assembly (city council) has agreed to exempt cruise ships from charging and collecting sales tax while they are in port in Juneau. We earlier reported that for the most part, cruise lines ignored collecting the tax, but the reason the city was considering eliminating it was that no other cities had laws on the books that required the cruise lines to collect sales tax so Juneau didn't ever want the cruise lines to get nervous about it reroute ships to avoid it. During the discussion, it came out that only one (unnamed) cruise line was actually collecting and remitting the tax. There was a faction that wanted to eliminate the tax because it would help the city appear “business-friendly” to the cruise lines. Last week we told you Carnival Splendor was limping to Miami for repair to its propulsion system after having to miss two of its four ports just to have enough time to get back to Miami for its Sunday turnaround. The plan was to make repairs during the turnaround, but technicians were unable to fix the ship on Sunday. Consequently, it is sailing on a drastically altered itinerary while additional repairs are made this week. Details appeared in the March 6 edition of Cruise News Daily. Look quickly, because once it's delivered you won't see Norwegian Joy again in the West for quite awhile. Meyer Werft floated out the 168,800-ton Breakaway Plus ship at their Papenburg yard on Saturday, and once it's delivered on April 27, it will be sailing right to China for the foreseeable future. 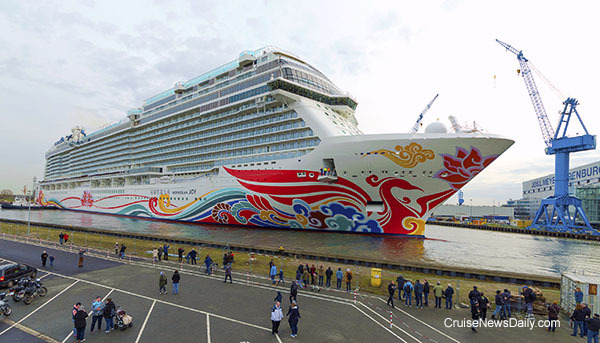 The complete story appeared in the March 6 edition of Cruise News Daily. Last week we told you about a German man who was living in Ireland and went on a Mediterranean cruise with his wife and children aboard MSC Magnifica. But his wife didn't return with him. He had a plausible story, but now the plot thickens.